This bundle includes a total of 34 + 3 FREEBIES. representing the Quadratic Functions. This bundle has been in construction for the past 2 years. It has grown so much that it covers so many different aspects of the quadratic function. Many aspects of this function are illustrated in this bundle. 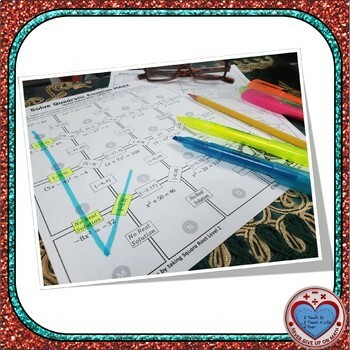 This activity is a good review of understanding how to "Solve Quadratic Equation by applying the Square Root Property" LEVEL 2. There are 2 versions in this maze. This maze is great to use with the Algebra I class as they're continue being exposed to such a technique. Please keep in mind that the questions of Versions 1 and 2 are the same, only the final answer is represented differently. 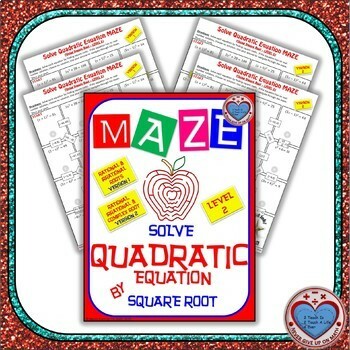 Please keep in mind that this maze focuses only on finding the solution by Applying the Square Root Property. Students are expected to take the square root of both sides as instructed in the directions. Hopefully this activity will enhance their understanding of this technique in solving quadratic equations. 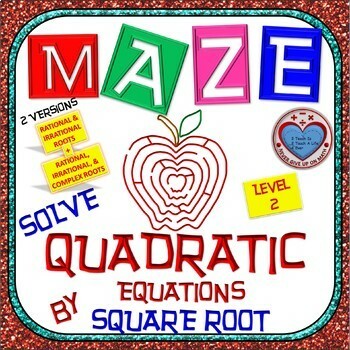 There are 15 quadratic equation provided in this maze. From start to end, the student will be able to answer 14 questions out of the 15 provided to get to the end of the maze. This maze could be used as: a way to check for understanding, a review, recap of the lesson, pair-share, cooperative learning, exit ticket, entrance ticket, homework, individual practice, when you have time left at the end of a period, beginning of the period (as a warm up or bell work), before a quiz on the topic, and more.